What does a fall of the Rupee mean to your pockets! A fall of domestic currency means alot to the associated country’s economy and its people. In recent times, huge fluctuations and a constant drop in the Indian currency, the Rupee, has uncovered the fact that our economy is facing hard and challenging times. Undoubtedly markets and economy suffers, but to a common man ,directly or indirectly, it hits hard on the budget, financial planning and investment strategies. This budget shift and change in the investor’s appetite works in opposite direction for Indians and Non-Resident Indians(NRIs).What is bad news to a common Indian, is definitely good news to a Non Resident Indian( NRI). For Indians: A common Indian’s budget is hit the most when rupee falls. Fast Moving Consumer Goods,oil,medicines, fertilizers etc become costly.Imported goods now become more costly than before. The reason being that when the rupee falls , more money is now paid for imports and to cover that cost, companies hike the price of their products indirectly hitting the consumer’s pockets.Industries dependent on imports face high costs of production and in turn may decide to cut on the salary packages of workers to bring down cost.Foreign education, buying a car, a vacation abroad (especially to the US) and even something as small as buying your favorite burger turn costlier now. 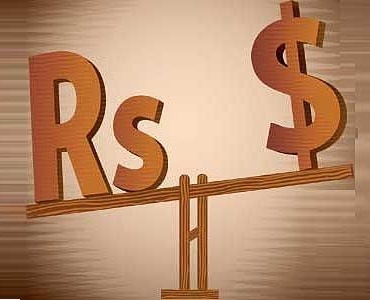 For Non Resident Indians (NRIs): As the dollar appreciates vis-a-vis the rupee, NRIs should start shifting focus on the Indian markets for investment because what costed them alot before will now be cheaper. Such investments mostly include real estate. By converting dollars to rupees, they can get more value for money because they now have more money to invest back in India.If there is a housing loan, then they can prepay maximum of your principal amount. Not only real estate, but even bank fixed deposits seem to have attractive NRE/NRO rates and in many banks there are no penalty charges on premature withdrawal.Thus, savings will yield them higher returns by the end of the maturity of fixed deposits than 6 months before. This fall of the rupee pays off to Indians working abroad who have a simple procedure to follow i.e transferring dollars into theirs NRE/NRO savings bank accounts back in India at high existing rates. For Indians, a close watch on pockets, less spending and more saving is the key mantra and for NRIs who haven’t yet taken the plunge in the Indian markets, there may still be time to cash in! The Rise of Inflation and the Fall of the Rupee! Its all about Europe this week!